Naturalized in 9 counties in California. Listed as invasive in South Australia, Western Australia and Tasmania due to its effects on agriculture and pasture. 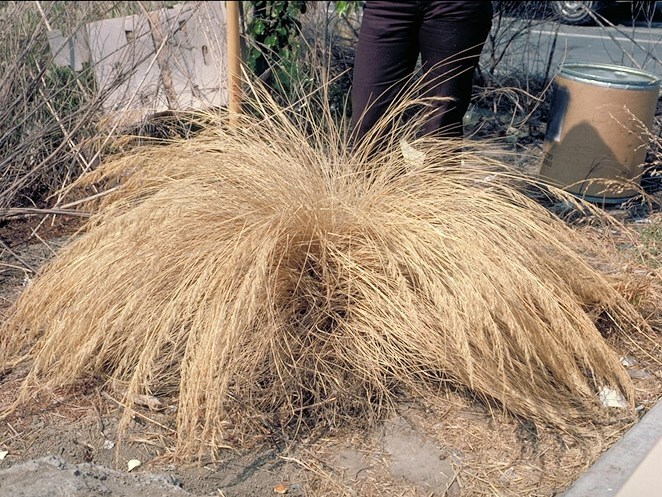 Listed under synonym Stipa brachyaeta in Parsons and Cuthbertson, which says that it invades disturbed soils along roadsides, waste places, and streams, and run-down pastures. Answering no because does not seem to have impacts in natural areas. Listed as invasive in South Australia, Western Australia and Tasmania due to its effects on agriculture and pasture. There are few locations in the Australian Herbarium, none from South Australia. The one point from Western Australia (Perth) matches California's climate. Confidence lower due to lack of information on where it's invasive. If you consider genus Stipa (its synonym), yes. Stipa capensis invasive in California. Other species of Stipa are invasive in Australia. Has a limited natural and invasive range but as most of the locations in Australia match California, I am answering yes. Native to Argentina. Invades disturbed sites or alfalfa fields in California, so not really affecting natural areas. A weed of overgrazed pasture, agricultural, and disturbed sites in Australia. No mention of this in any references. Foliage unpalatable to livestock. In Australia, can seriously reduce the productivity of pastures. However, the references seem to indicate that it mostly invades pastures that are already poor quality. Grows up to 1m or occasionally 1.5 m tall but no information on how dense it is or whether it creates "impenetrable" areas. Reproduces by seed. No mention of any vegetative reproduction. Does not have creeping rhizomes. Reproduces by seed. No mention of any vegetative reproduction. This species produces two types of seeds, chasmogamous (with pollination) and cleistogamous (self-pollinating). Lerner found that mature tillers of punagrass can produce 250 chasmogamous seeds and low (<20) numbers of cleistogamous seeds each. 30% of tillers had chasmogamous seeds. She also found that plants produced a mean 1215 to 1619 cleistogamous seeds (lower number in poor conditions; higher in good conditions). This is difficult to translate into simple numbers because her studies were comparing plants derived from the two types of seeds. However, based on these numbers, I'm answering yes. Lerner, P. D. (2005). A COMPARATIVE STUDY ON SEED HETEROMORPHISM IN ACHNATHERUM BRACHYCHAETUM (GODR.) BARKWORTH AND NASSELLA CLARAZII (BALL) BARKWORTH. Department of Plant Sciences. M.S., 123. Seeds germinate in autumn and grow over winter (Australia). Lerner tested dormancy breaking treatments on seeds (after a chilling experiment) and found low germination rates with or without the treatments (25% or lower). However, she cited another study that found 40% germination for the chasmogamous seeds falling on the soil surface. Since it's a grass, it seems likely that it would produce seed within three years. Flowers May to October in California. Could not find information on seed production. In Australia, flowering starts in late spring and continues through summer if moisture is available. Interpreting these together as a yes. Cross-pollinated seeds are often dispersed after their awns become attached to animals, clothing, or vehicles. Fine hairs on awns and callus allow seeds to stick to wool, clothing, and other material. Dispersed by water, particularly during floods. However, Parsons and Cuthbertson says that water is a minor component of dispersal. Awns attach to vehicles. Can also be spread by mowing or in contaminated agricultural products. Fine hairs on awns and callus allow seeds to stick to wool, clothing, and other material. In both California and Australia, this species is a weed of agricultural crops or highly disturbed areas. Invades mostly overgrazed pastures in Australia.